What lies behind the most widespread images of the EU? The EU debate is shaped by powerful narratives. In order to analyse the EU from a critical perspective and develop effective strategies, we need to know what underpins these images. 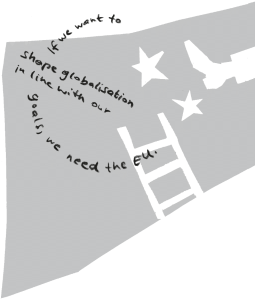 The winds of globalisation are shaking the European social model. International financial markets are threatening the stability of whole currencies and economies. No one state has the power to defend itself against these dangers alone – but as part of the EU, member states form the world’s largest economic power. They can shape globalisation in a way that benefits us all. Whether in regard to the single market, the euro or the Fiscal Compact: the above image of the EU has been invoked again and again to make new steps of integration palatable to the population. It is clear that many of the issues of today’s capitalist system cannot be resolved at the national level. If we wanted to prevent corporations and financial markets from pressuring social systems and public budgets, we would need cooperation between states, for example in the form of common minimum standards for social services and environmental protection. We would also need to agree minimum tax rates on profits and assets. But the EU does not do any of this. On the contrary: with the introduction of the single market and the euro, it has further intensified competition between member states. Capital can now move between member countries in an unregulated fashion and countries can be played off against one another. The EU treaties even prohibit members from restricting capital movements into and out of non-EU states. During the crisis, the negative role played by EU institutions intensified. As part of the Troika, the European Commission and the European Central Bank have been actively working to reduce the living standards of the general population in countries such as Greece, Portugal and Ireland. Privatisation, wage cuts and welfare cuts have been forced through in search of higher profits for capital holders, pursuing the logic at the heart of neoliberal globalisation. This stands in stark contrast to the treatment of the financial sector, the ones responsible for the crash. European elites are not scaling down and breaking up the big banks, but are instead pursuing the banking union and capital markets union. These do little to fix the basic issues. At the same time, the EU is seeking to integrate financial markets in Europe more deeply; in other words, to reduce regulations for banks even further. Market concentration will continue to increase, and the big banks will become even bigger and more powerful. The power of the financial sector, a consequence of neoliberal globalisation, is not being hemmed in by EU policy, but rather exacerbated. The EU’s behaviour towards the rest of the world has similarly disastrous effects. Whether as part of the WTO or through individual trade agreements, the EU is constantly pushing poorer countries to open up their markets to European corporations. One particularly disastrous example of this is agriculture. Industrially produced agricultural products from Europe are exported at dumping prices, which is ruining smallholder farmers in the Global South. To sum up: Neoliberal globalisation, a process that inevitably leads to social and ecological crises, is not a law of nature, but is politically manufactured. Rather than offering protection against this process, the EU is one of its most important drivers, both externally and internally. Its policies primarily promote corporate interests – at the expense of the general public. For centuries, Europe knew nothing but war. Germany and France, in particular, clashed repeatedly on the battlefield. A tragic low point was the Second World War, which resulted in millions of deaths and severe devastation. After that, however, Europe’s nations came to their senses. They forged a union in the hope that Europe would never know war again. There is likely no narrative about the European Union more powerful than that of the peace project. 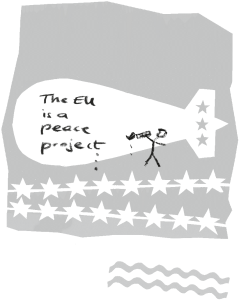 Today, with the EU losing the backing of the population and experiencing an existential crisis due to its neoliberal orientation, the peace project is often the last remaining argument in its defence. In 2012, the EU even received the Nobel Peace Prize. “For over six decades”, the committee stated, the EU had “contributed to the advancement of peace and reconciliation, democracy and human rights in Europe.”. Since 1945, there have been no internal wars between any members of the EU or its predecessor, the European Economic Community (EEC). This is a huge step forward in historical terms, especially in light of the two world wars that came before. Undoubtedly, the prevention of wars was an important motive for many of the politicians who initially advocated European integration. Nevertheless, the peace project narrative falls short. The founding of the EEC was also intended to serve less humanistic motives, one of which was driven by the Cold War. The association between Western European states was forged partly as a response to the simultaneously emerging Eastern bloc. The EEC was a capitalist counter-project to the “real socialism” in another part of Europe. This played no small role in promoting the interests of the USA, who had financed rapid reconstruction through the Marshall Plan. The enormous influx of capital safeguarded the state of peace and facilitated the beginning of Western European integration. In addition to this, economic interdependence was rendered the primary mechanism of converting former enemies to partners. In the following decades, war became less attractive as a political option as it would have interfered with capital interests. This does not diminish the achievement, but does place the so-called “peace project” in a different light. The notion of internal peace often also contrasts sharply with the behaviour of numerous EU members abroad. France’s war in Algeria caused as many as 200,000 deaths, and Belgium was responsible for various bloody conflicts in the Congo, even after independence. Of the current 28 EU members, 25 participated in the war in Afghanistan and 14 in Iraq. Ten EU countries contributed to the bombing of Libya, an action which is largely responsible for the catastrophic situation in the country today. Membership of the EU is not necessarily a guarantee that states will behave peacefully. Collectively, the arms exports of EU countries in the last twenty years have been only slightly below those of the US or Russia. Even regimes such as those in Saudi Arabia or Syria are supplied by weapons from the EU. The Lisbon Treaty of 2009 and the EU Global Strategy of 2016 take things one step further, laying out plans for the comprehensive arming of all member states. The President of the European Commission, Jean-Claude Juncker, has, on numerous occasions, called for the creation of an EU army as the logical next step from the “Battlegroups” that have existed since 2005. To date, these multinational combat units have never been deployed and are designed to be used primarily on the basis of UNO mandates. They are currently undergoing training for combat in deserts and jungles. In 2017, a new military centre was established in Brussels. To sum up: The narrative that the EU is first and foremost a peace project is historically ambiguous – and becomes less and less plausible with each passing year. Though the EU is first and foremost an economic union, a “social Europe” is also a clear goal of the treaties and institutions. 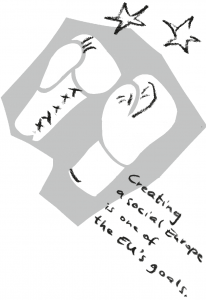 Even today, the EU is characterised by the European social model that sets it apart from countries like the US. Though social justice is often neglected in the current climate, it nevertheless remains a major concern. The importance of social policy in the European integration process has always been relatively low. Until the 1990s, the EU lacked a common approach due to the absence of agreed competences and the unanimity required to implement them. Although social democracy and trade unions were more powerful than they are now, little progress was made. Only a small number of progressive measures were implemented, including in the areas of occupational safety or gender equality. Although the legal foundations of social policy were strengthened in the 1990s, they were also made subordinate to the goal of competitiveness. It was at latest with the introduction of the single market and the Economic and Monetary Union that neoliberal economic policies were solidified as the core of European integration. Influenced by Tony Blair and Gerhard Schröder, even social democrats believed that economic liberalisation and higher profits would improve the standard of living for all. This was not true, but was used to justify social cuts over the period of a decade. Neoliberal policies were enshrined in the treaties and mandates of EU institutions. Unrestricted trade within the Union, the curtailment of democratic budgetary policies and the liberalisation of public services were made legally binding. At the same time, when it came to social policy, binding legislation was replaced by voluntary coordination mechanisms. In light of all this, we can conclude unambiguously that social policy in the EU is subordinate to economic goals. It is also required to be productive and to serve the goal of competitiveness. 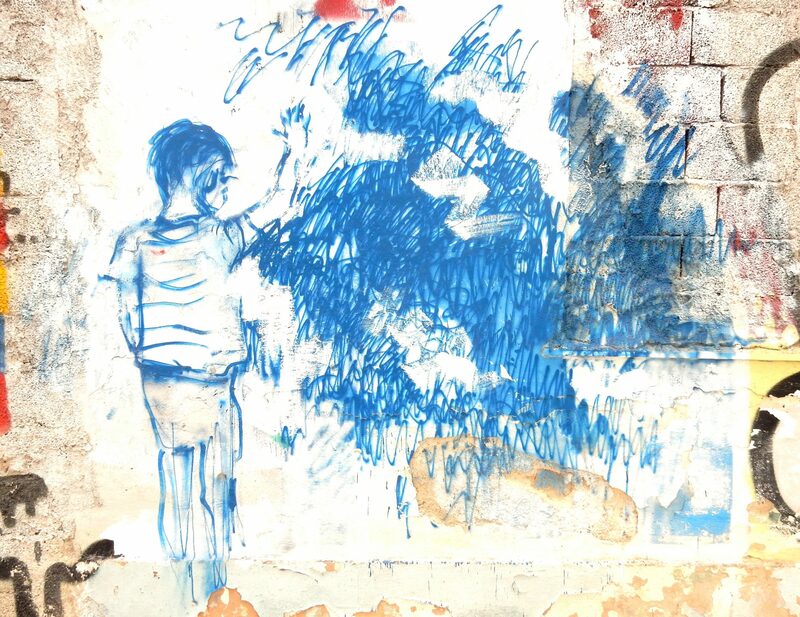 The debate on the EU’s “social pillar”, which began in 2017, was a clear indication of this: according to the EU Commission, this pillar was necessary because the social consequences of the economic crisis were acting as a barrier to future growth. The EU required efficient national labour markets and social systems in order to remain competitive. For the Commission, therefore, social policy is not a distinct policy field, but is subordinate to the imperative of competition. Prior to this, social standards across the EU had undergone years of whittling down, while tax competition was fuelled. The few remaining European social policies are used primarily by the elites to legitimise their neoliberal policies in other areas. This neglectful attitude towards social policy in the EU is also illustrated clearly by the attitudes of the EU Commission and the ECB. In 2012, ECB President Mario Draghi told an interviewer that, “The European social model is history.” This same attitude is reflected in the recommendations that the European Commission and the Council make annually to member states. Almost all states are encouraged to privatise, reduce pensions and social benefits. Within the framework of the Troika, the ECB and the EU Commission have implemented far-reaching social cuts in participating countries. With pension cuts in Greece, cuts to social benefits and family allowances in Ireland and cuts to health and education in Portugal, the Troika measures have destroyed welfare states and hit the weakest hardest. To sum up: A “social Europe” is repeatedly cited as a goal of European integration – yet social policy is merely an accessory to the neoliberal core of the EU. As long as this neoliberal core persists, there can be no social Europe. European integration represents a departure from the bloodthirsty nationalism of the 20th century. 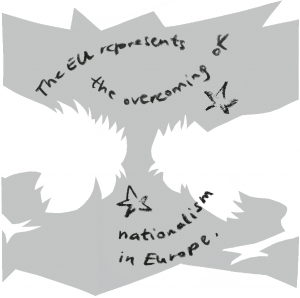 The new, united Europe is helping eradicate dangerous notions of national identity. Because of this, a strong EU is also our best remedy against the extreme right. It helps us to overcome nationalism and racism. Hostilities were ongoing in Europe for a long time – between Germany and France, for example, or between Austria and Italy. Though these hostilities no longer exist today, nationalism is very much alive and well. The difference is that today, a country’s sense of superiority is based primarily on economic factors. Pride in a nation is not, as it once was, drawn from the strength of their army, but from the competitiveness of its industry. Austrian and German employees are depicted as being especially hard-working, Southern and Eastern Europeans as “criminal” and “lazy”. The quality of a country’s production is emphasised and, as with “Made in Germany”, rendered a national hallmark. The single market and the euro are exacerbating this competition and thus also this particular brand of nationalism. It was expressed particularly openly at the peak of the crisis, when politicians justified the impoverishment of southern Europe by citing its economic weakness. They spoke at length about “lazy Greeks who lie in their hammocks” and, like children, must be compelled to “do their homework” or “move out of their mother’s house”. All these are statements that have actually been made. Nationalism in the EU is no longer directed against inherited enemies, but against economically weaker ones. This enables the elites to drive a wedge between the people. The rise of right-wing parties also makes clear that nationalism and racism are not a thing of the past. In fact, the EU does not protect us from the extreme right, but rather fertilises its breeding ground. Decades of neoliberal politics have robbed countless people of their livelihoods and destroyed social solidarity. This is what the right has seized on, and it can be seen particularly clearly in the example of the labour market. Today, employees in the EU are in direct competition with one another. If a company’s labour costs are too high, it can easily relocate its production to another EU country, or practise wage dumping by hiring workers from poorer EU countries. Many employees then blame their Eastern European colleagues, not the exploitative company. Increasing competition not only leads to falling wages, but also to increased resentment and racism. Today, forms of racism linked closely with the idea of a European identity are also gaining traction. As in a nation station, the reference to “Europe” creates the sense of “in here” and “out there”. In order for the positive qualities and superiority of Europe to be confirmed, it has a need to distinguish oneself from another and allegedly inferior group. Today, it is primarily Muslims who are used in this way. Europeans are depicted as enlightened, secular, equal and peaceful, while Muslims are portrayed as stereotypically fanatical, sexist, oppressed and aggressive. This image is directly rooted in colonialism. Against this background, the construction of a European identity is always a racist one: one social group is rendered “the other”, while the positive qualities of one’s own group are exaggerated and idealised. To sum up: The left and social movements are fighting nationalism and racism. There was a great deal of hope that the EU would be by our side – but the opposite has occurred. European integration has created new negative stereotypes and cultivated a breeding ground for the extreme right. Thanks to free trade and the single market, the EU brings economic opportunities for all. The removal of trade barriers facilitates investment, boosts economic growth and brings benefits for the entire population. The “economic and social progress of all countries” was first cited as a goal in the founding treaty of the EEC in 1957. But although gross domestic product (GDP) is growing steadily in the EU, the rate of growth since the 1970s has been slower than that of the US. Since the beginning of the crisis, economic output has scarcely increased at all. The EU’s overall figures also obscure the fact that several countries, such as Greece, Italy and Finland, have suffered several years of recession. Additionally, the significance of GDP is limited, because the groups who benefit from the growth – and at what social and environmental price – remains hidden. In fact, prosperity gains are distributed extremely unevenly both between member states and within individual populations. Across the EU, wage share, which measures wages and salaries as a share of total national income, has been falling for a period of decades. Between 1975 and the 2007 financial crisis, it fell by between 3 and 15 percentage points in all EU-15 countries except Greece. In the years following 2007, it rose again slightly for a short time; however, not because of higher wages, but because corporate profits declined more during the crisis. The people’s share of total wealth is shrinking, and has been for a long time. In many EU countries, the wages and salaries of the lowest income groups have been falling in real terms since the 1990s. At the same time, the profits of owners and investors are rising. The concentration of wealth is also increasing, with more and more assets in the hands of a few super-rich. At the same time, 123 million people, a quarter of the population, are at risk of poverty and social exclusion in the EU today. This is no coincidence and no consequence of external developments. The economic functioning of the EU is based on the principle of competition, since capital, goods and services can move freely within the EU. Effectively, this means that not only companies, but states themselves that are placed in direct competition with one another. They compete for investments and production sites – in short, to win the favour of corporations. In the absence of common minimum standards, this competition between member states has led to wage decreases and social cuts everywhere. The construction of the EU and the single market favours the interests of capital, while the interests of workers from different countries are often contradictory. The EU’s policy also destroys social prosperity in various direct ways. Numerous directives have forced member states to sell state-owned property and open up public services to the private sector. The disastrous crisis policy of recent years has further damaged the general population’s standard of living. EU rules have forced austerity across the Union, deepening the crisis and exacerbating social consequences. The most momentous of these consequences were seen in Greece, Portugal, Cyprus and Ireland, where EU institutions, acting as part of the Troika, forced the dismantling of the welfare state and plunged millions of people into poverty. What’s more, through its agricultural and trade policies, the EU is increasing poverty and inequality in the Global South. 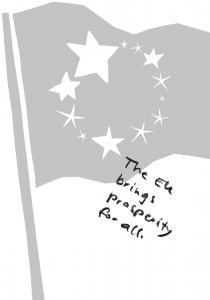 To sum up: The EU does not bring prosperity for all. Instead, it brings profits for the few and increasingly poorly paid, unsafe jobs for the many. EU policy is destroying the social infrastructure required for the vast majority to have a good life.